A step-by-step process to help you score sponsors (templates included)! You know you want to secure enthusiastic and generous sponsors for your upcoming retreat. You see other people doing it, and you know that you can too! But the idea of trying to figure out how to actually make it happen has you feeling frustrated and overwhelmed. You try to piece together a strategy, but you just don’t feel confident about it. How do you find the right contacts to ask? What the heck are you supposed to ask for? The unknowns are enough to make you put it on the back burner (which is never a place for something that can bring you free products, financial support, and meaningful relationships). Whether you are planning a morning workshop or a weeklong retreat, one of the easiest ways to increase value, minimize expenses, sell more spots, and increase your profits is by learning how to score sponsorships! And that, my friend, is why I created the Sponsorship Secrets Masterclass. Grab your spot for only $129! I love that you're interested in learning how to secure sponsors for your retreat! Whether you are planning an event for 5 people or 500, it is hands down one of the most powerful ways uplevel your event (and your business). Through my career in higher education and as a small business owner I have planned hundreds of events: retreats, conferences, trainings, international service experiences, summits, and workshops. 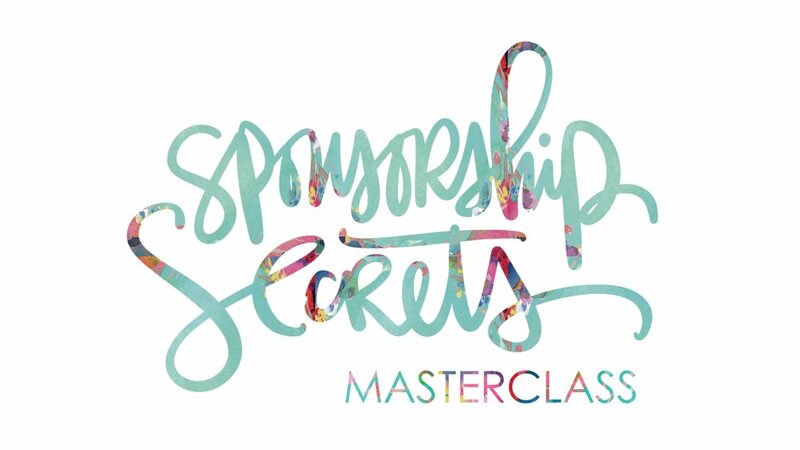 In the Sponsorship Secrets Masterclass I will be sharing with you the EXACT PROCESS I used to score over 100 sponsors for my first post-professional event. Plus, I am giving you everything you need to replicate my results - spreadsheets, templates, email swipe copy, and more, to get you on track and securing sponsors in no time (seriously, check out the bonuses)! Module 1 / The Basics. You know you want to offer a retreat or workshop and you've heard that bringing on sponsors can make or break your event. During this module you will learn everything you need to know about the specific types of sponsorship so that you can reach out with confidence and ease. Module 2 / Essential Prep. This is where I'll outline the process for positioning your retreat in such a way that super aligned sponsors will be asking for your mailing address to send you checks and products. Module 3 / The A-Z Process. Once you have a clear understanding of the basics and have constructed your unique foundation, it's time to start with outreach. I'm going to outline the entire process from beginning to end. I'm going to give you my personal systems to stay organized (and teach you how to use them), share my best practices for finding sponsors (including my favorite under-the-radar resources), review how to land sponsors that are aligned with your mission and event outcomes, teach you how to create & sell sponsorship tiers, and so much more. BONUS / Sponsorship Research Tracking Spreadsheet One of the keys to sponsorship success is staying organized. Tracking your outreach efforts can get messy, but not when you take full advantage of the exact spreadsheet I use to confidently track potential and confirmed sponsors. BONUS / Sample Outreach Letter Ready to start reaching out but unsure of exactly what to say? No worries, I got you. ;) I'm giving you the actual letter I sent out that resulted in over 100 sponsorships. BONUS / Sample Follow Up Letter Sometimes you need to follow up. It's ok, it happens to all of us. But you don't want to seem annoying right? I get that. That's why I am giving you the actual letter I use to follow up with potential sponsors (this is the one that turns "maybe" into "definitely"). BONUS / Sample Sponsorship Tiers Proposal. One of the toughest documents to create is the Sponsorship Tiers Proposal. I am going to give you a copy of the one that brought in over 20K in sponsorships. BONUS / Sponsorship Promotion Tracking Spreadsheet. Once you've scored your sponsorships, you'll have a list of promises to keep, and that requires a system to stay organized. You're getting the exact spreadsheet I use to track promotions, swag package arrivals, social media posts - everything you need to keep your word and build sponsor relationships that last. Sign up today and start securing sponsors for your next event!